At meeting several weeks ago of the East End Clinical Connection, retired banker Tom McAlbee presented “Operation Medicine Cabinet,” an initiative of the Lloyd Magothy Water Trust (LMWT). 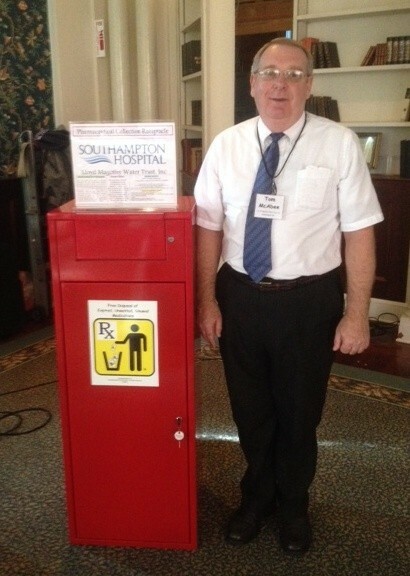 Together with Pharmacist Bob Grisnik of Southrifty Drug of Southampton, Tom is advocating for: 1) Safe storage of prescription meds to reduce and eliminate misuse, accidents, and theft that supports addiction; and 2) Safe disposal of unused meds to protect our drinking water. LMWT is seeking to put medicine disposal boxes — like the one pictured — in every commercial pharmacy. Joining a campaign begun by the Suffolk County Police Department, Tom says, “do not flush meds down toilet . . . and don’t store unused meds.” He shows dramatic information about how chemicals from improperly disposed prescription meds are increasingly showing up in our drinking water in Suffolk County, the leading culrpits being compounds from psychotropic drugs! Tom and Bob are currently working on a campaign to raise $100,000 for setting up disposal boxes at 350 pharmacies. For more info about the work of the trust, go to www.southriftydrug.com.